I'm off to Chicago for the weekend to do the ALA's Fight for Air Climb. It's not as hard of a climb as the ESBRU, and I anticipate it will take me longer to finish (even though it's a shorter climb), but it's kind of an exciting deal anyway. It's my little brother's first race. I have two siblings: an older sister, who's an avid (and sponsored) athlete, and a younger brother, who up until recently has been an overweight fast-food lover. I'm somewhere in the middle: an avid (but mediocre) athlete who also loves fast-food. I'm now being left behind in my brother's dust. He hired a trainer early last year and has gotten his act together. It's been an amazing - and inspiring - transition. He's really turned his entire lifestyle on its head and has kept it up and is seeing amazing results. So, next step: his first race. He's not (yet) a runner, but he regularly does the stairmill at the gym and chose this stair climb as his racing debut. We're doing it together, hopefully, as in literally step by step together. I'm kind of afraid he's going to blow me away! Wish me luck. Back on Monday for regularly scheduled running. 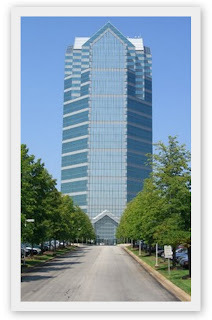 Oakbrook Terrace Tower: It's not quite the ESB! Good luck to you both! Looking forward to hearing all about it!